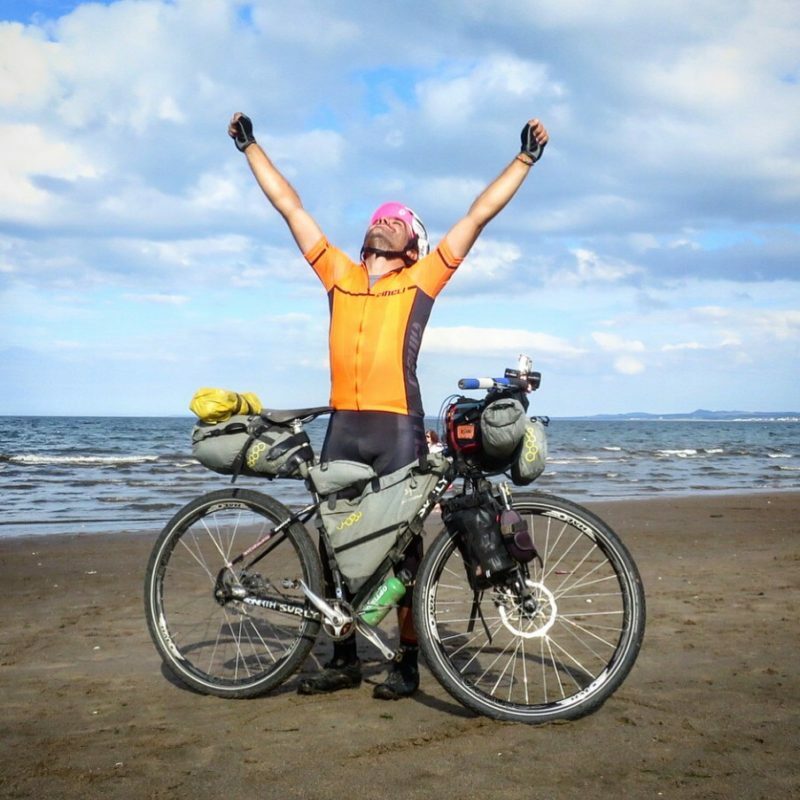 I have done it, I have cycled around the world on a singlespeed bike. From 3 September 2015 till 27 August 2016 I covered 34,097 kilometres trough 26 countries, all on the same gear. I had a lot of fun, I had good and bad days, I met wonderful people along the way. With only a few plane tickets booked and no planned route I first rode through Western Europe over the Pyrenees to Barcelona. The next stop was Iceland to finally experience the Aurea Borealis, but as I soon found out it came with fierce winds and rain, all good to harden me up for the rest of the trip. Next I went to cross the US from New York to Santa Monica and on to San Francisco for the New Years fireworks. I had worked in both New York and San Francisco in my pre-bikepacking life, so it was great to be back finally. Tracing back more memories I jumped on another plane to ride the Tour Aotearoa Route through New Zealand in January, cycling mostly off road in the country where I lived before settling in Scotland. The most remarkable part of the journey for me was crossing the Nullarbor plain in Australia on one gear. As I chose a mountain bike ratio of 32/18 for the whole trip to be able to cycle as many hills as I could find, riding flat roads wasn’t an easy feat to do. After Australia I touched down in Singapore to ride through the fierce heat and humidity of Southeast Asia in April, through Malaysia, Thailand, Laos and Vietnam to Hanoi. I lost one clothing size in the progress, drinking up to 12l of water to survive the heat. From there my brother joined me for three weeks cycling across Northern Iran, the highlight of my trip, sampling the outstanding hospitality of the Iranian people, and riding up to the highest pass of the journey at 3150m. Crossing Turkey the rest of the trip took me through the Balkans and back to my family in Germany, and from here the long way to Scotland. If you would like to know more about the trip, I recommend watching the video above. If you would like to speak to me about the trip, please get in touch here. And finally. Why singlespeed? Why not? 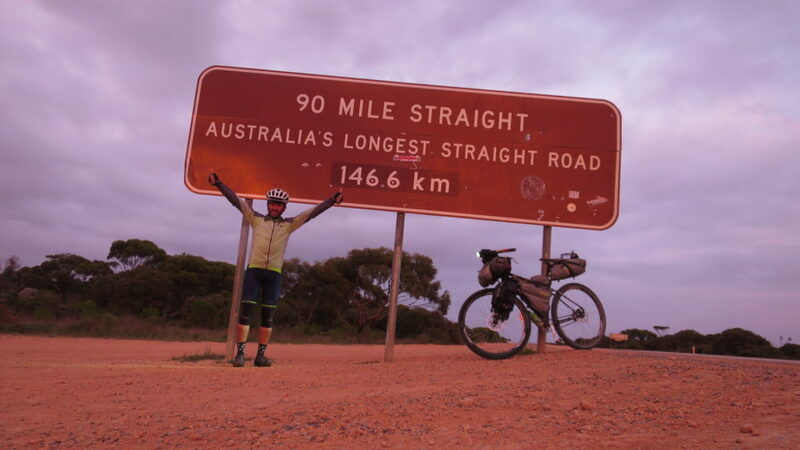 I have a huge passion for adventure cycling, it has given me the life I love with many superb friends across the globe. At the same time my appetite for simplicity and endurance has developed, and since I took a one speed bike to Germany I have continued to tour on that, cycled Land’s End to John o’Groats, climbed mountain passes in Scotland, finished the Highland Trail 550, Strathpuffer and Relentless 24, all on one very fine gear. Good luck and have fun Markus!!! For sure! Thanks Bruce, some of build was inspired by you! If you go by Frankfurt, you can stay in our house. I’ve got a bike workshop in the basement, a yard outside for a nice BBQ and a spacious guest room. Impressive! Can I ask what front/rear gear ratio you will be using? Sure, likely to be 32/18, but this might change to 33 possibly. The freewheel from Halo comes in 16-18, so that’ll be the range, Surly rings go down to 30 I think, but 32 is the lowest I’d go for. Hi there, planning to do a 32-18 ratio, but that might change once I have packed and ridden the bike in the next weeks. All the best! You whizzed past us at The Crook Inn where banana man was stationed, on the Carlisle to Crammond night ride. We then met you on the prom at Crammond…have a fantastic time. Wow, alles Gute für das Abenteuer und die Reise! Trip sounds great, have a good one. I am in New Zealand Feb & March for the Tour Aotearoa next year, if you are about at that time drop me an email, we could have a beer. How do you like that Cambium Saddle for the long haul? It’s pretty ace, will take it for round the world. Done a great job so far! What is your route West from Singapore? Velkomín to Iceland and to Hotel Rjúkandi in Snæfellsnes! I just want to say congratz! Amazing adventure! I hope you will be fine in your trip to Grundarfjörður. Probably in your way out of Snaefellsnes you will cross our place so you are very velkomín! This looks like an excellent way to spend a year. One question; your pics show WTB Nano tires, but your list has Schwalbe. Which is it and why? Thanks and have fun! Hi! Markus, awesome. Just curious, why did you skip India, or not swing up thru Russia…? By the way, look,up Thomas Stvens and Thomas Allen, they wrote books you would find very interesting, about similar round the world rides in the 19th century on singles, one of which was a high wheeler…! You can get their books on Gutenberg.com. I’ve been riding a single for about 2 years now, as it is the only setup that will withstand daily city commuting in mud rain snow down to minus 30. Rides out to the country of over 100 km I found to my great surprise and satisfaction are no problem. It’s really a different riding style from a road bike, but it teaches you some things and I think makes your better rider. And most of all the strength and reliability and resistance to weather are the greatest attributes, which for a long tour in rough conditions is important. I use Sturmey Archer hubs with the,sealed,drum brakes, impervious to rain snow and mud, and no adjustments or tinkering necessary. Highly recommend.